Hmm...Finally I got time to write a new entry for my blog. This entry is dedicated to all the community work and will remain stuck to the Adobe punchline "Giving back to Community". You must have noticed the image at the top. What is this all about? Is it an painting illustrating the rich usage of color by an well known artist or an example shown by an art instructor? 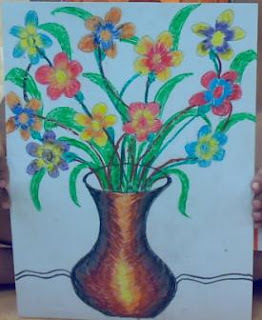 No, it is nothing like this but this is the creation of a girl, who won the first prize in an art competition hold by Adobe for the children of an orphanage. This event was hold on 8th May 2k8 in Adobe Campus and I volunteered for this event. But thanks to loose scruples of some people, I could not be there for a longer time :(... BTW, when I saw this painting I felt very embarrassed as I am not very good in using colors and this painting for sure deserves a award. Though I wanted the same little girl to win who won when our team hold the event over Diwali and we decorated our work area using those paintings.